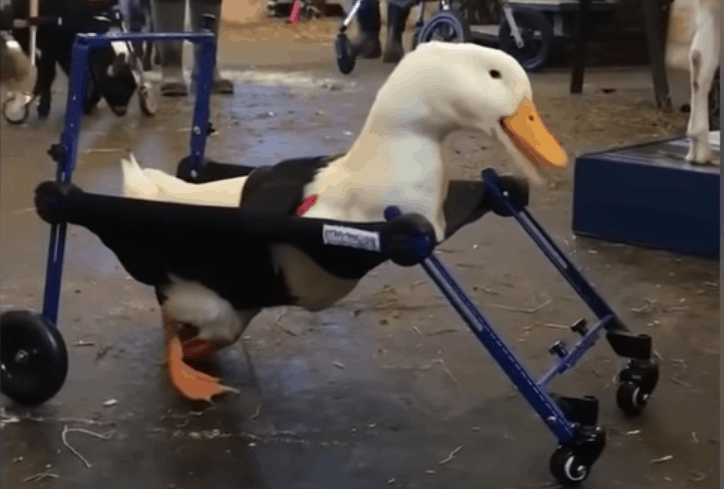 A disabled duck called Merlin has been given a new chance after being born with a birth defect in his leg. This meant that he struggled to swim, but couldn’t walk at all. But, last November, the Goats of Anarchy sanctuary in Annandale, New Jersey took him in to try to help. As their name suggests, the Goats of Anarchy sanctuary specialise in helping goats. Specifically, they help disabled goats. However, the good people here did not hold Merlin’s species against him. They intended to help him just as they would a goat. The sanctuary cared for his needs, but they knew he needed specialist help. The Goats of Anarchy sanctuary got in touch with their friends at Walkin’ Pets, in the hope that they could help little Merlin out. Walkin’ Pets, based in Amherst, New Hampshire, have made specially designed wheelchairs for pets since 2001. The engineers at Walkin’ Pets usually build mobility aids for cats, dogs, and goats, but they made an exception for Merlin. 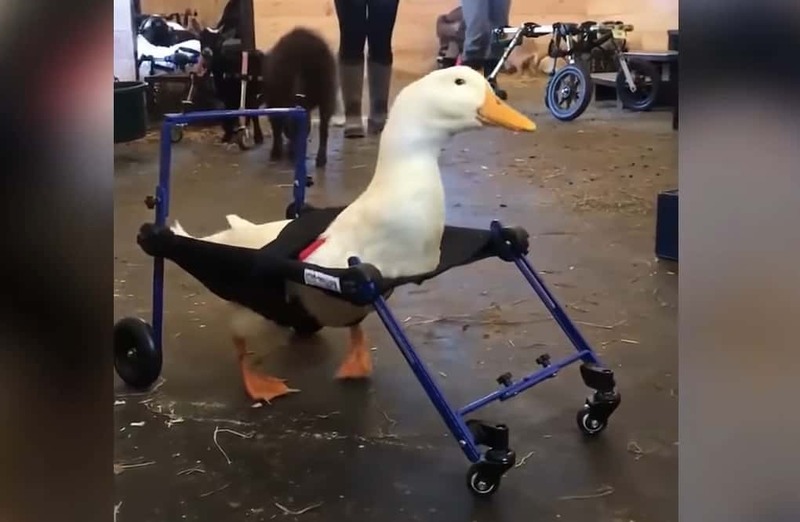 They soon modified their smallest wheelchair to help the disabled duck. “I was thrilled my company was able to help a handicapped duck, our first one ever,” Mark Robinson, founder of Walkin’ Pets said. 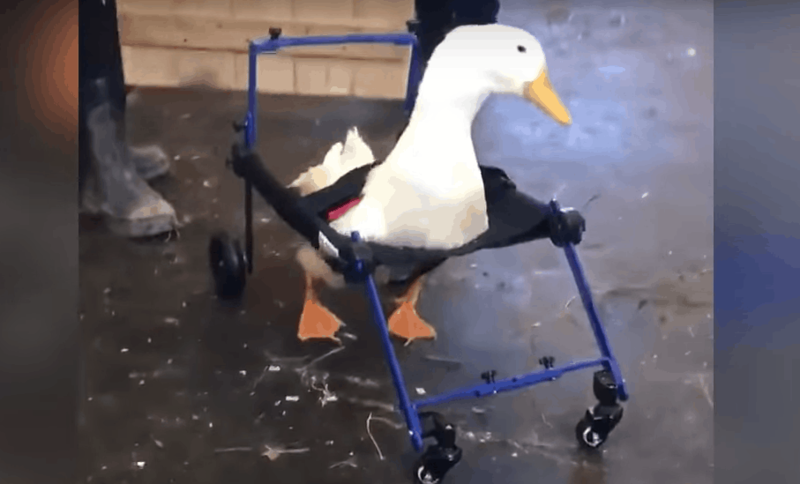 Merlin has been waddling around in his new wheels since February, and it has given him more mobility and freedom to be the duck he truly is. Social media coordinator for Walkin’ Pets Mikayla Feehan caught his first steps on camera. “To see Merlin taking his first steps in that wheelchair really warmed my heart,” she added. Merlin has come a long way, and the team hope he will continue to adapt to his newfound mobility. Have you ever seen a cuter duck? Let us know in the comments, and share this heartwarming story with your family and friends! Be sure to check out similar stories on Happiest.